Welcome to my little world- I am thrilled that you are here. My most sincere hope is that this little blog is a source of laughter, inspiration and some seriously fabulous food (even if it is vegan!). Is it possible to maintain a vegetarian lifestyle below the Mason Dixon line? Come along with me and find out as I pound the pavement, travel and eat my way through life. Cheers! A collection of recipes, traveling and entertaining tips. May I Get You A Drink? Happy Election Day! Whether you are voting Democrat or Republican, I think that there is one thing that we can all agree on- the need for a big sign off to the political season. 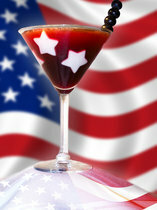 What better way to give a presidential (or in this case senatorial) wave good-bye to the endless campaigns than a patriotic cocktail? I give you The American Dream courtesy of Market Fresh Mixology. Cheers! Cut mini stars out of white fondant. Using water, gently wet the back of each star and press into the inside of a cocktail glass. Fill a mixing glass with all ingredients add ice to tin. Shake well and strain into the star studded cocktail glass. Garnish with blueberries on a pick. This entry was posted on 11:56 AM You can follow any responses to this entry through the RSS 2.0 feed. You can leave a response, or trackback from your own site. Great idea! Yes, I'll be quite happy to see the end of political commercials and signs polluting the landscape. Ready for it all to be over and to start anew tomorrow. I just stumbled across your blog for the first time and thought I would say hello! I looked through a few of your posts and love your style. Seriously, what a fabulous idea for a blog. Being a hostess is one of my favorite things in life. The idea of making people feel comfortable and happy in my own home is one of the best feelings. Back in college I even did a study of the art of hospitality. I'm a blogger as well, about the world of art, but my history is in interior design and fashion...and now hosting. I love to hear what people are saying! Hope we get to see more of each other in the future.